I don't know if anyone else had the trouble I had in realizing exactly what this image is but I figured I'd mention it. I was thrown off by what appeared to me to be multiple absorption lines in the same color only to realize later that it's not the same color on each row but that each row transitions from right to left (if read from top to bottom) to the next row. Anyway, if you took each line and set them end to end you'd get one big linear spectrum instead. It was just cut into many pieces to fit it in a reasonable aspect ratio. geckzilla wrote: Anyway, if you took each line and set them end to end you'd get one big linear spectrum instead. It was just cut into many pieces to fit it in a reasonable aspect ratio. of the Balmer series of emission lines of the hydrogen atom. the centre wavelength of which (589.29 nm) is given the designation letter "D". 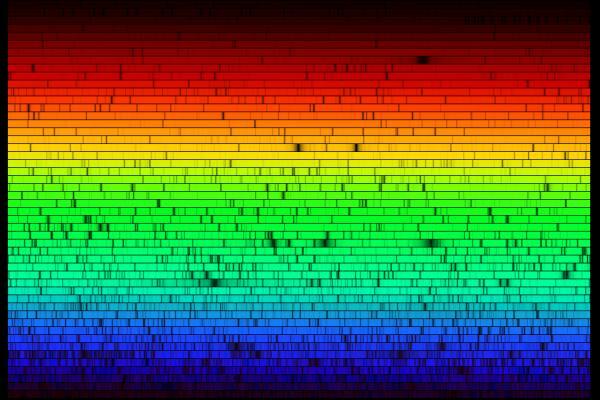 <<The English chemist William Hyde Wollaston was in 1802 the first person to note the appearance of a number of dark features in the solar spectrum. In 1814, German physicist Joseph von Fraunhofer independently rediscovered the lines and began a systematic study and careful measurement of the wavelength of these features. In all, he mapped over 570 lines, and designated the principal features with the letters A through K, and weaker lines with other letters. Modern observations of sunlight can detect many thousands of lines. It was later discovered by Kirchhoff and Bunsen that each chemical element was associated with a set of spectral lines, and deduced that the dark lines in the solar spectrum were caused by absorption by those elements in the upper layers of the Sun. Some of the observed features are also caused by absorption in oxygen molecules in the Earth's atmosphere. Note that there is disagreement in the literature for some line designations; e.g., the Fraunhofer d-line may refer to the cyan iron line at 466.814 nm, or alternatively to the yellow helium line (also labeled D3) at 587.5618 nm. Similarly, there is ambiguity with reference to the e-line, since it can refer to the spectral lines of both iron (Fe) and mercury (Hg). In order to resolve ambiguities that arise in usage, ambiguous Fraunhofer line designations are preceded by the element with which they are associated (e.g., Mercury e-line and Helium d-line). Because of their well defined wavelengths, Fraunhofer lines are often used to characterize the refractive index and dispersion properties of optical materials. <<Joseph von Fraunhofer (6 March 1787 – 7 June 1826) was born in Straubing, Bavaria. He became an orphan at the age of 11, and he started working as an apprentice to a harsh glassmaker named Philipp Anton Weichelsberger. In 1801, the workshop in which he was working collapsed and he was buried in the rubble. The rescue operation was led by Maximilian IV Joseph, Prince Elector of Bavaria (the future Maximilian I Joseph). The prince entered Fraunhofer's life, providing him with books and forcing his employer to allow the young Joseph Fraunhofer time to study. After eight months of study, Fraunhofer went to work at the Optical Institute at Benediktbeuern, a secularised Benedictine monastery devoted to glass making. Due to the fine optical instruments he had developed, Bavaria overtook England as the centre of the optics industry. Even the likes of Michael Faraday were unable to produce glass that could rival Fraunhofer's. In 1824, he was awarded the order of merit, became a noble, and made an honorary citizen of Munich. It's so funny how a person whose profession deals with the human eye can make such a great contribution to science overall. I am still relatively new to a lot of these topics, and I can honestly say I am not fully grasping the Fraunhofer Lines, but I'm still amazed after browsing through this wiki. Good stuff! I had an "ah-haaaaa!" moment when i discovered just about everything gives off light, sometimes not in the visible spectrum. thanks for the upload of this series!